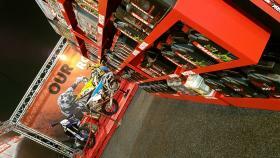 Dirtbike Show in partnership with Motul returns! Join us at Europe's largest off-road event, the International Dirt Bike Show, from 1st - 4th November 2018, at NAEC Stoneleigh Park, Warwickshire. Get involved in all the action and find us in hall 2 on stand A06B. Take the opportunity to find out about the latest from our off-road range, developed in conjunction with leading MX1 teams both globally and here in the UK. The International Dirt Bike Show is the premier indoor off-road event in the calendar and is the perfect chance to stock up on kit and accessories, meet riders, watch action packed displays and stunts, win prizes and see the latest bikes for motocross, trials and enduro. With plenty to do and see, don’t miss out! Take advantage of the advance ticket offer HERE!